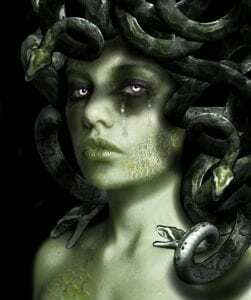 Medusa was raped in Athena’s temple by Poseidon because of her incredible beauty. Athena, as a virgin goddess, took the full anger on her, turn Medusa into this monster we knew of. Her gorgeous hair is now the snake, and whoever sees her eyes would become stone. What it looks like is, the victim should not to be the victim. The part that makes greek myth so attractive is that their god and goddess are very close to human. Humans make mistake, therefore it leads the reader to judge them with no fear. I think this story is trying to say, the person who holds more power is always right. Athena was known as a powerful goddess, but she was never a feminism. Sodha, Mumtaz. “The Secret of Medusa.” Surya Therapy, 1 Apr. 2016, www.suryatherapy.com/the-secret-of-medusa/.